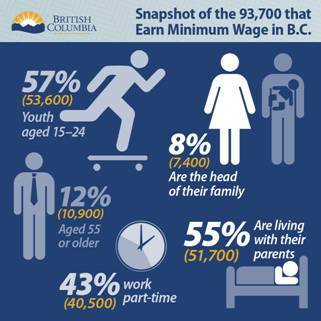 (TRI-CITIES) May 6, 2016 - Wednesday, the Provincial Government announced a two-stage increase to the minimum wage to $11.25 by September 2017. While the government has promised certainty and predictability in the minimum wage by tying it to the Consumer Price Index (CPI), these increases are larger than expected. We expect this change to directly affect approximately 10 per cent of our membership employing people either full-time or part-time at minimum wage, based on a compensation survey that was sent out in Fall 2015. However, the Province has also announced an initiative to reduce the burden of this increase on small business through a 40 per cent reduction in the small business tax rate by 2017-18. This is an encouraging development that will help mitigate the impact of an increased minimum wage. A successful small business is expected to be able to leverage this tax relief to offset the cost of increasing wages for six or seven staff impacted by the first stage of the minimum wage increase.